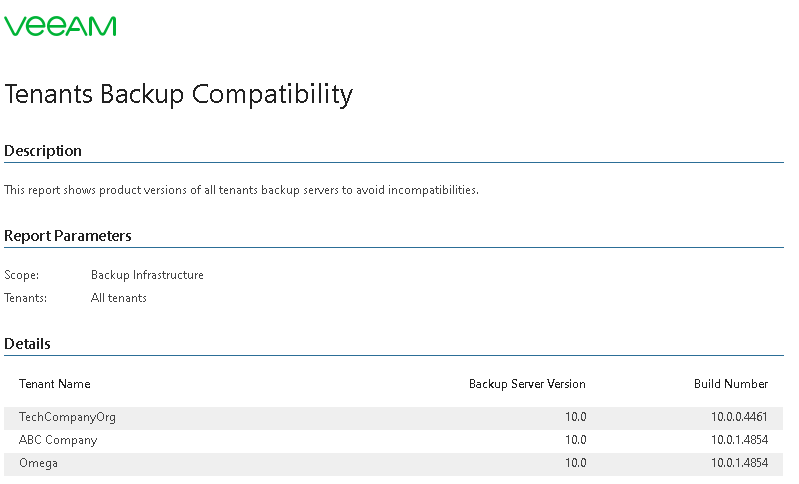 This report shows what versions of Veeam Backup & Replication run on backup servers of Veeam Cloud Connect tenants, and analyzes whether these versions are compatible with Veeam Backup & Replication running on the service provider backup server. The Tenants without Compatible Backup Servers table shows a list of tenants that run Veeam Backup & Replication 9.0 or earlier. The Tenants with v9.5 Compatible Backup Servers table shows a list of tenants that run Veeam Backup & Replication 9.5. Tenants: defines a list of Veeam Cloud Connect tenants to include in the report. If the service provider runs Veeam Backup & Replication 9.5, it is recommended that tenants connected to this service provider also upgrade to Veeam Backup & Replication 9.5. Tenants who run an earlier version of Veeam Backup & Replication cannot leverage the full cloud connect functionality, as features introduced in 9.5 will not work for them and might result in failed jobs. For details, see Console Versions in Veeam Cloud Connect Infrastructure.